Thank you for all of the fans around of Taiwan in support of Aki Tanaka’s solo photography exhibition at 1839 Little Gallery. 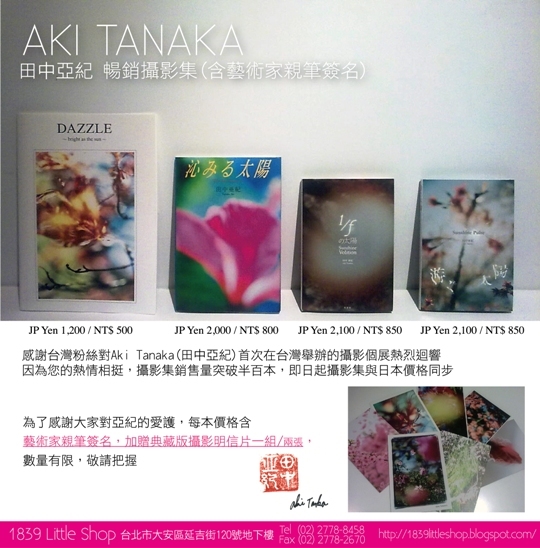 With your continued support, the photo books of Aki Tanaka had been sold over half hundred volume within month. Effectively, the books new price sold at the same price in Japan. We deeply appreciate your continuing support and encouragement, when buy every single book, you are not only get a FREE of the artist’s signature on the book, but also get a FREE one set 2 pieces of collectable postcard. To order the book, please click here at 1839 Little Shop or stop by 1839 Contemporary Gallery to buy them.